The giant kerb stones of Newgrange, and many of those at Knowth, weighing up to five tonnes apiece and more, were sourced along the coastline at Clogherhead, and brought by sea and river to the Bend of the Boyne, where the great megalithic monuments at Brú na Bóinne were built more than 5,000 years ago. 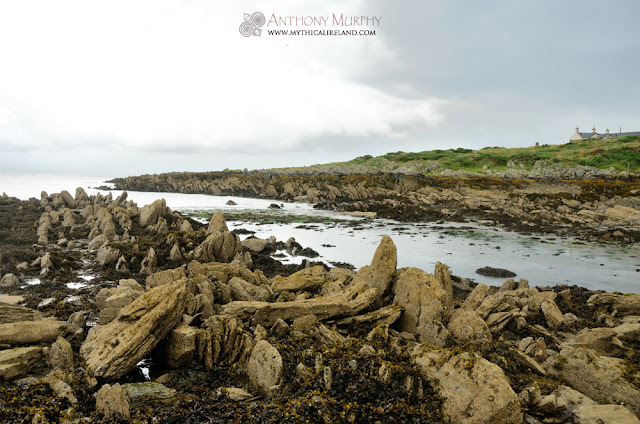 What is not widely known is that Clogherhead holds a fascinating geological secret, one that is extremely unlikely to have been known by the ancient megalithic builders of the Boyne Valley. At this promontory of land that projects out into the Irish Sea from the coast of what is now County Louth, there are rock formations which are vertical. The stones jut up out of the land in jagged layers. It was here that, over five millennia ago, the builders of Newgrange, Knowth and Dowth sourced many of the large stones that were used for kerbing, and for orthostats and structural stones. A map showing the approximate seam or fault line (border) that once separated the two continents. What the builders did not know was that these jagged rock formations are the result of a significant seismic event 400 million years ago, in which two continents smashed together. It's hard to imagine today, but there is a "border" of sorts running from Clogherhead down to the Shannon Estuary. Everything north of this "border" was once on a continent that has been given the name Laurentia, while everything south of there was on a continent called Avalonia. The types of fossils found either side of this so-called border, which is now called the Iapetus Suture, are very different. It's hard to believe that Laurentia and Avalonia, and by extention the northern and southern parts of Ireland, were once separated by 3,000 kilometres of ocean! This ocean has (in modern times of course) been given the name the Iapetus Ocean - hence the Iapetus Suture. 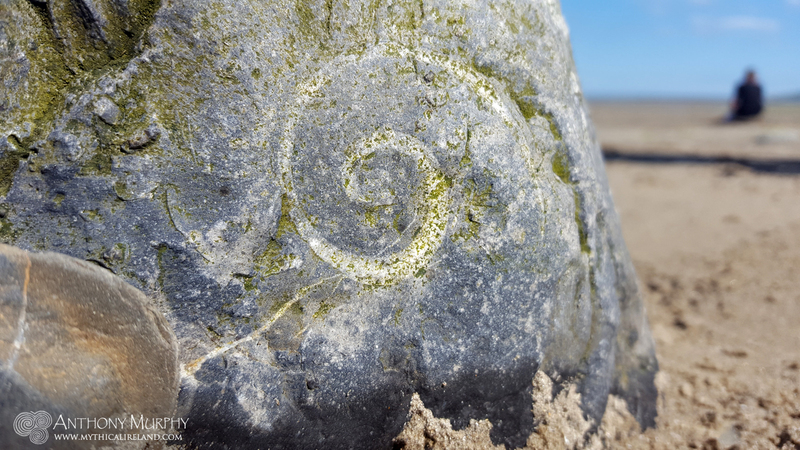 A spiral-shaped fossil at Clogherhead. The half of Ireland that lies north of the seam was originally joined with Scotland, Greenland and North America in the ancient continent of Laurentia. 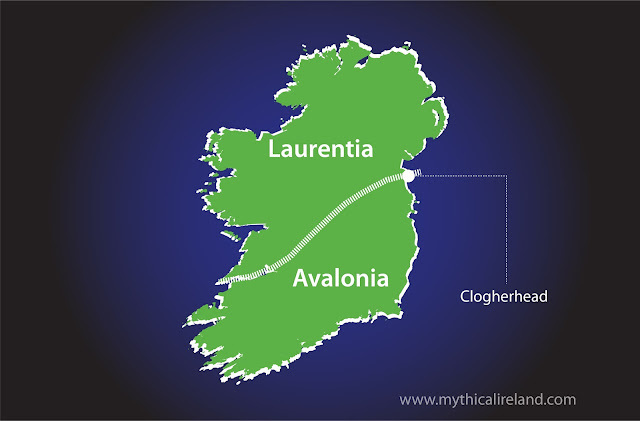 The south-eastern half of Ireland, along with Wales, England and Brittany, formed the smaller continent of Avalonia. Some 500 million years ago Laurentia lay at the Equator, Avalonia lay further south, and between them was the Iapetus Ocean (Iapetus was the father of Atlantis, after whom the Atlantic Ocean is named). Fossils from this time found in the northern Laurentian, or ‘American’, half of Ireland are very different from those found in the Avalonian, or ‘European’, half. This reflects the fact that they came from distant parts of the world once separated by 3,000 kilometres of ocean. An inlet at Clogherhead where it's possible Neolithic mound builders tied large greywacke slabs on to barges. The builders of Newgrange used the vertical formations of layered greywacke at Clogherhead to their advantage. 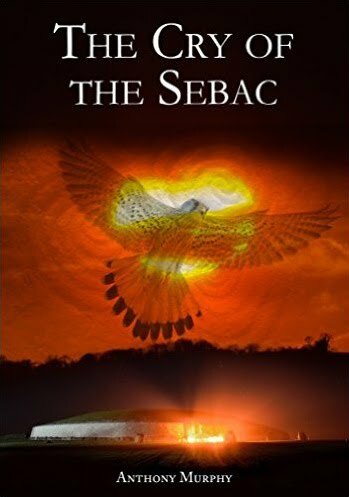 They were, it seems, able to prise specimens out using something like wooden poles and, we are told by archaeologists, strap them to the underside of a barge. At high tide, the sea would lift the raft, with stone underneath, and the "pilot" of this barge would steer it down the coast and up the River Boyne. thank you, this is very interesting ! And now it's only a stones throw away!